Business Sutra |5.3| Vikram and Vetal :: The Ancient India’s Case Study Method – The world is too small? or Is it? We have covered four episodes of Devdutt Pattanaik’ TV serial on CNBC 18: Business Sutra. The first presented to us the most visible form of the business – the corporation: its meaning, its purpose and its action perspective. In the second episode Devdutt Pattanaik discusses Leadership: Role of the leader, Context of the leader and Leadership in different business cycles. The third episode relates to the Business Ethics and Morals: business ethics and dilemmas, relationship between owner and the organization and The Right (Dharma) – the Ramayana way and the Mahabharata way. The 4th episode deals with Conflicts, of the Board and the CEO and that of the means vs. ends. The present episode takes unto the realm of Education, wherein Part 1 covered the basics of education to the (potential) leaders in Ram’s Education and Part 2 addressed the Knowledge Transfer to Next Gen. The third part deals with the issue of student motivation. Most of the management trainers as well as trainees come across such situations almost every day. We will take a short peep into the theory of motivation related issues and then an equally look at the Learning Organization. 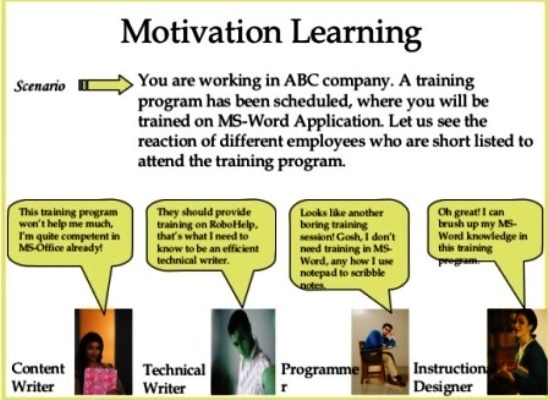 Learning Motivation And Performance – Effective training practices are developed from theories and theoretical constructs that describe how learning occurs and what motivates people. An understanding of motivational theory allows a manager to improve employee performance levels by applying the principles of motivation to his firm’s unique circumstances. The same is true with training. Whether one company’s training program will work in another’s, will depend on the needs of the latter company, its employees, and the training system used. Copying without understanding is like taking someone else’s prescription drugs. Even though they may have made someone else better, they could kill you. The article very lucidly presents WHY ARE THEY RESISTING AND WHAT CAN I DO ABOUT IT? Any search of the management literature will yield fairly huge amount of coded body of knowledge on “How To’ aspect to the motivation for the training.. So, we will not attempt to list such resources once again here. One would wish that theirs is a Learning Organization that keeps recharging itself for bracing up the present and the future challenges. So, How do you define a learning organization? Peter Senge, Author of The Fifth Discipline, answers the question by first suggesting that “we jettison the jargon” and work on organizations where everyone works together successfully. He discusses how there are only two dominant factors within an organization: control or learning and the question is which one is dominant. He lays out the major factors that need to be present in order for an organization to be centered in learning. So, how do we find out: Is Yours a Learning Organization? . In an HBR article, David A. Garvin , Amy C. Edmondson ,Francesca Gino have provided the conceptual framework. For an easy reference, we may listen to this video clip of “An interview with David Garvin and Amy Edmondson, Professors, Harvard Business School. Salesmen and author Zig Ziglar once wrote: “the only thing worse than training people and having them leave, is not training them and having them stay.” At a learning organization education happens as a side-product of working together, as everybody learns from each other to adapt to whatever the future might bring. Here again, one can explore a huge data-mine of high-quality content in the present western management literature. So, we will leave it to the readers to whet their appetite, in their own context. 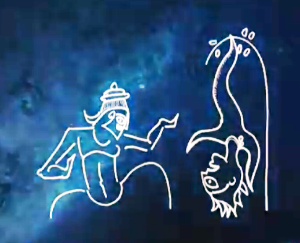 In the Segment 3 of the episode 5 Devdutt Pattanaik takes up the subject of Student Motivation through the metaphor of a well-known folktale of Vikram and Vetal. Whenever the school bell rings have you seen the students? The first thing that you hear when the school bell rings is a great amount of cheer-joy and children running out. The children run out because it is almost like the cry of the domesticated beast, that has been tied and fettered in the classroom and suddenly he is being liberated. So he wants to run away from school. This is the education system, or for that matter even a training program in a corporate world we have created. You are dying for the lunch break and the coffee break because you just cannot keep your eyes open, You are being pushed into this space where they are going to domesticate you using various methods like 9:30 to 10:30 sessions where you learn something intensely, as if your brain is going to sort of get bombarded with lots of information. What does not get attention is the simple fact that whether the student is motivated willingly to enter the school. No. So he has to be pushed in, broken inside. It is almost violent to the process of education and training. Now let us look at a different method. Let us look at the Indian method of training. 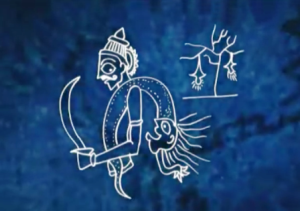 This is a folktale- that of Vikram and Vetal, The Ghost. The folktale explains it in a very powerful way. Vikramaditya was a great king and one day a sorcerer came to him and said go to a cremation ground and find for him a Vetal, a ghost. Vikramaditya said. ‘Of course, whatever you want I shall give it to you.’ Being a great king he was willing to give anything to anybody who came to him. So he goes to the crematorium.in search of the Ghost. The instruction is that here is a banyan tree and the Ghost hangs upside down. You have to pull it down and carry it on your shoulders, but never speak to it. If you open your mouth and speak to the ghost, the ghost will fly away and then you will have to go back, and collect him. Yes, the Harvard business school has put it to use for many years now very successfully. So the Vetal keeps asking questions and Vikramaditya being a very wise king is able to answer all the questions. So for 24 times the stories are told, 24 times the questions are asked and 24 times the answer is given, and all 24 times the Vetal flies back; much to the exasperation of Vikramaditya. Vikramaditya has to go back and recollect the Vetal and then go through the whole process of storytelling again. It is a cyclic, boring thing. It is like that sales cycle. Every month at the business plan meeting you hear the some story, questions are asked and you reply them and cycle repeats next month. It is horrible. You want the liberation from that. Finally the 25th time Vikramaditya is unable to answer the question. He genuinely does not know, because if he would have known the answer, his head would have split into 1,000 pieces. Vikramaditya heaves a sigh of relief. Now I have got the ghost and I take him back to the sorcerer. The ghost laughs, a typically Hindi film laugh. He says what a foolish man you are? Do you realize every time you answer the question you were saving your own life? The fact that you cannot answer the question means now you are in trouble. The moment you will take me to the sorcerer, he is going to bottle me and turn me into a genie. I will be very powerful genie and the first thing I will be asked to do is to kill you. So, all the time when you were problem solving and you were getting irritated by that you didn’t realize that that is the only reason you are king. You exist to answer questions. You only matter when you solve problems. So you should welcome problems, rather than saying, ‘Oh I don’t want problems in life. If there are no problems, then what is the use of a king? It is a beautiful metaphor, because the day the problems go away your utility as a king reduces to nothing. The Smashshan Bhoomi, the cremation ground, where the ghosts exists, is the training room. No business happens there. It is a cremation ground and the trainer or the facilitator or the Guru, whatever be his role, the Vetal has nothing to gain by the training. He is paid for it anyway. If it is a good training or a bad reading, whoever gains or loses from the training session is the participant. Therefore, it is the Vikramaditya who has to come to this Smashan Bhoomi. The Vetal would not come to Vikramaditya. So, in ancient India the teachers never went to the students. They did not have the advertisements for colleges and schoolJ. If you want to study you come. If you do not want to study, then do not come. It is the student who stands to gain or lose. it stays. That is the teacher’s job. As he inspires the student he himself grows too. This is Saraswati Dan- the endowment of knowledge. The essence of the discussion is that any training has to happen between an inspired trainee and an inspired trainer, so as the training result into intellectual growth of both the parties. It is not done as mandatory mundane task. It has to be performed in the spirit of making an endowment. In our continuing journey of Devdutt Pattanaik’s TV serial Business Sutra, we will move on to the 6th episode – Measurements.